Why do you want to see more cat pictures on the Internet? If you have a sense of humor at all, you will want to see these cat pictures. Luna, with her ridiculous poses, crazy expressions, and wacky behaviors, is a funny bone-tickling specialist. Combined with my goofy creativity, will raise the concept of the Internet cat picture to a higher standard. The revolution begins! … now. Have a question or comment for Luna? (or for Scott) Write it here! If it begins with “Dear Luna”, the answer may be featured in a future post! So Luna meets your approval? She’s half silly chicken. Absolutely! I have had 5 gray tabbies, and loved them all! I also had 2 seal point siamese, a white persian and a black mutt. I bet the persian was hiding chicken blood under all that fur. Persians are funny creatures 🙂 Luna especially trusts animal lovers, but please, do not try to steal her. One of the posts describes how she reacts to her fans. It’s not pretty. Hi, thanks for the follow. I see you’re in love with cats. I love kitties, but I can’t have them in my home for reasons over which I have no control. But all the best with your cute Luna. Not all cats, just Luna! Cats aren’t for everyone, but feel free to experience one vicariously through my blog if you wish 🙂 Looking forward to seeing some of your future writing, and glad to meet you! Glad you like cat pics! But it’s more about the story! I could replace Luna with a rabbit and I think I’d be just as successful! It’d probably bite me less too. This blog cracks me up – thank you for posting kitty pics LOL – and thank you for checking out and following my blog ….much appreciated. Kitty pics are serious business to Luna. She’s be considered a professional if I didn’t trip on her so much. Much thanks for following First Night Design! The cat was probably intending to do something rather profound, but that darned extra digit always gets in the way. Hey, have you ever been to the Hemingway House in Key West? So many polydactyl cats! There was a really fluffy one on the bed named “Arthur”. It is adorable, and I have and love a cat of my own. Yes, your blog is similar in some ways for sure. Cat thoughts, baby thoughts… all up to our interpretation. 🙂 Dorian will eventually, hopefully, help me with ideas to collaborate on entries, who knows. Great to meet you, and looking forward to seeing your posts. On a side note, how did you find me? Found you one way or another browsing through the Meet & Greet. Been finding a lot of great concepts for blogs there. Awesome and good to know– I always wonder how people find me. There are definitely some great finds… now if I could only pause time to read all of them. 🙂 Thanks again, and I am looking forward to reading more of your blog from a cat’s eye view. I understand that sentiment entirely. I just pick out a few at a time off my reader and leave meaningful comments, connecting with those bloggers in some way. Eventually, ill trim diwn the bloggers I follow to the ones I’ve made friends with. You’ll be among those! Hi thanks for the follow! Aww Luna looks very cute! I love looking at more cat pictures. Glad you like Luna! Hope you enjoy her future pictures and stories! Hi, found you through OM Meet & Greet! Love cats so will probably like your blog a lot. Am allergic so can’t have one myself…so have to enjoy them vicariously through blogs like yours! you have a great blog, and thankyou for following my blog, your appreciation is highly valued. Hope to see many more great posts from you. Thanks so much! Will relay to Luna as well after she finishes her English studies. There are a lot of blogs that I found through that Meet & Greet that I wanted to follow, but you definitely had an “about” page that spoke to me, and you write beautifully as well. Looking forward to seeing more from you. Luna is one smart cat, she really does have a good sense of humor too. And thanks again, started the blog, to make myself write despite the busy schedules, and your appreciation just made it worth it! Hello! Thank you for following my blog (Converse with Kurti). You have a very adorable cat 🙂 Cheers and best! 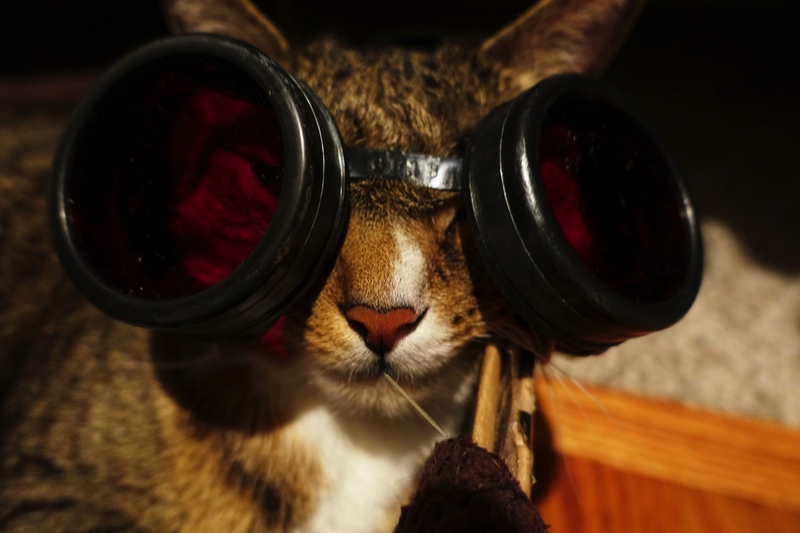 LOL…I just love those goggles on Luna! I found your blog by way of my “Big Sis” (Not a real sis, but I wish), Recovery Journey of Author Cat Lyon and I just had to come meet Luna! I’m a new teen blogger and would appreciate it if you could tell any teens and parents to come by my blog sometime? I WILL be back to see what Luna is up to Next!